What better way to end the calendar year than with a hike on the FLT? Earlier in hunting season I had "knocked off" the long road walk of M20 along Route 11 and W. River Road, and in early October I had hiked the eastern half of M19, returning to my car on Babcock Hollow Road along the orange blazed "Dabes diversion". That left the mostly-trail segment from River Road to the top of Virgil Mt still to be done. Together with the return trip, the leg would fall neatly into my 15-20 mile sweet spot, so I slung on my day pack and headed west and uphill from my car on River Road. From River Road the trail heads steeply uphill along the scenic rim of a small river gorge, quickly to emerge smack in the back yard of somebody's house. "Sure hope they're members," I thought as I gingerly crept by within 5 feet of a picture window, trying my best to look like a normal part of the scenery. Further along I snapped a quick cell phone pic looking upstream at the Tenkate bridge, my shaky hands conspiring with the laws of optics to produce an interesting effect I never could have gotten with forethought. Trail conditions can be summarized in one word: slippery! Above 1600 ft. there was a uniform 1-2 inch layer of slushy snow that required a kind of stiff-legged strut to navigate any grade steeper than 5%, and which made side hill traverses dicey and dangerous. On downhill stretches through Tuller Hill SF I worked to perfect a primitive form of 'skiing' on hiking boots made possible by this slick layer. The speed gained thereby partially made up for the slow-going, but nevertheless I emerged on Carson Road a good hour behind schedule. 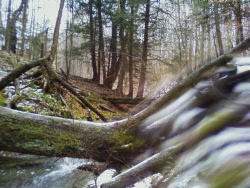 Read the rest of Terry's interesting adventure at Finger Lakes Trail email group, and consider joining to always know what's going on.